Constantinople, and a relation of Emperor Theodosius. Her father died shortly after her birth, and her mother, also Euphrasia, devoted her life thenceforth exclusively to the service of God. To carry out this ideal she abandoned the capital, and, with her seven-year-old daughter, repaired to Egypt, where she dwelt on one of her estates, near a convent, and adopted the nuns' austere mode of life. This example aroused in her daughter the desire to enter the convent, and her mother gave her into the care of the superior, that she might be trained in the ascetic life. Theodosius, on behalf of a senator's son, transferred to the emperor her entire fortune, to be used for charitable purposes, and took up, with a holy ardour, the rigorous practices of Christian perfection. She was about thirty when she died. Her feast is celebrated in the Greek Church on 25 July, and in the Latin Church on 13 March. 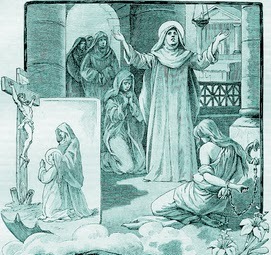 She is mentioned by St. John Damascene, in his third "Oratio de imaginibus".